Sgt. 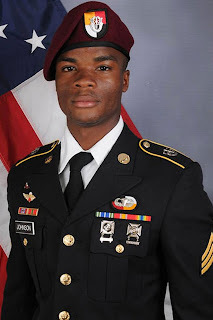 La David Johnson, the dead U.S. soldier whose wife Donald Trump disrespected during a condolence phone call, was found with his arms bound after being killed in a Niger ambush in October. Witness testimony suggests that he was captured and executed. Johnson was one of the four U.S. soldiers killed in the suspected ISIS ambush. Adamou Boubacar, a 23-year-old farmer and trader, said some children tending cattle found the remains of the soldier Oct. 6, two days after the attack outside the remote Niger village of Tongo Tongo, which also left five Nigerien soldiers dead. The children notified him. When Boubacar went to the location, a bushy area roughly a mile from the ambush site, he saw Johnson’s body lying face down, he said. The back of his head had been smashed by something, possibly a bullet, said Boubacar. The soldier’s wrists were bound with rope, he said, raising the possibility that the militants — whom the Pentagon suspects were affiliated with the Islamic State — seized Johnson during the firefight and held him captive. The villagers’ accounts come as the Niger operation is under intense scrutiny in the United States, with lawmakers expressing concern that they have received insufficient or conflicting information about what happened. The Pentagon is conducting an investigation into the attack in Niger, where the U.S. military is helping the Nigerien government confront a threat by militants associated with the Islamic State and al-Qaeda.